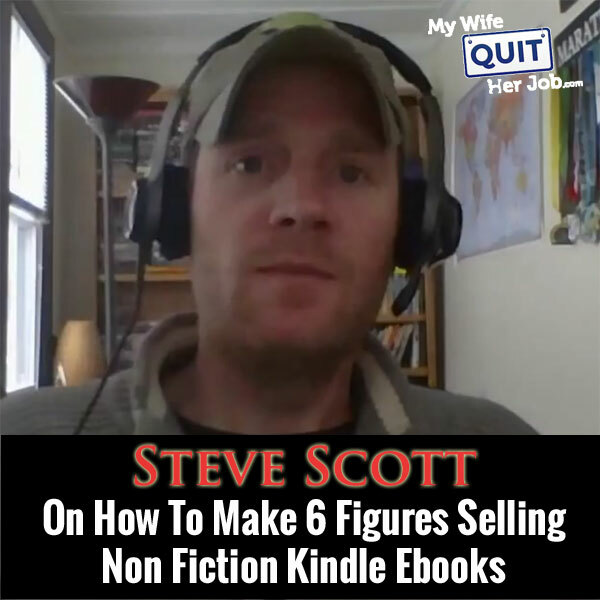 Steve Scott is a very prolific writer on the Amazon Kindle platform and he makes anywhere from 20-60K per month selling ebooks. In this interview, he reveals the exact methods he uses to sell hundreds of books a day and the right way to sell on the Amazon Kindle platform. Steve: Welcome to the My Wife Quit Her Job podcast. In this episode I’m going to be talking to Steve Scott. Now the reason why I decided to bring Steve on the show is because I wanted to interview someone who makes a living selling Kindle E-Books. Now I was just looking at one of his income reports just now and he averages several hundred book sales per day, and that’s pretty crazy. Now Steve’s book sales allows him to live a very flexible lifestyle and travel the world. And unlike Johnny Andrews who I had on my show last time, Steve actually focuses on nonfiction Kindle books and generates a very good and reliable income from it. Anyways today I’m hoping that Steve will reveal some of his book promotion strategies with us. So without further ado welcome Steve, what’s up man? Scott: Thanks for having me on Steve. Actually it’s funny you mentioned Johnny Andrews; I’m talking to him later today for the first time. So I’m kind of excited to hook up with him to see what he is up to. Steve: Yeah it will be interesting to compare kind of your strategies with what he talked about a couple of weeks ago. He focuses on fiction books; I think he does off the wall fiction books. Scott: Yeah something like that but yeah I kind of– I definitely agree because I thought I heard him say once about how he really just narrows down on one thing and just keeps on creating content for the same audience which I completely agree with him on that one. Steve: Yeah and he was saying something about how fiction books seem to outsell the nonfiction ones. I’ll get you a commentary on that a little bit later. Steve: But give us the quick background story, tell us about how you kind of got started with this whole thing and all the sort of businesses that you run. Scott: Sure. I guess I’ll give the very-very brief overview of kind of my history but I started with online marketing about 10 years ago. So 2004 I kind of run a couple of business, it’s just kind of what a lot of people do when they first get it started. I just kind of fell for all the get rich quick scams and tried my hand at a bunch of different things. So I fumbled along for about two years till around late 2005 early 2006 when I got into what I call authority affiliate marketing. The idea there is just you pick a niche, you create an email list, and you try marketing to that particular email list. So I did that for pretty successfully from 2006 to 2012, but around 2012– actually even before that I was really kind of souring on the niche I pick. It’s mostly like the dating niche and just– it was just really not part of who I was at that point of my life. So I would say around 2010 is when I started Steve Scott site, and again that’s kind of another way I kind of fumbled along. But I spent a year or two trying to figure out the whole blogging thing. And eventually I started talking about internet business and stuff because that’s honestly what I knew best about. I guess that was my biggest authority knowing about how to run an affiliate business and internet business in general. And in 2012 in September I just started to really focus in on kindle books. I already published a couple of them previously but I saw that they sold fairly well, like they were selling five to ten copies a day which in my opinion wasn’t too bad of an income for something that wasn’t too hard to write. So in September 2012 I decided to just focus completely on the kindle stuff and kind of the rest as they say is history. So since then guess it’s been two years now, I’ve been almost 90% of my time just focusing on writing kindle books. Steve: We delve in to the whole kindle thing. Can you kind of– you mentioned you have Steve Scott site and you were doing affiliate marketing. Can you comment on kind of– by going all in on kindle you kind of relying on Amazon as your platform and your selling platform, right? Steve: Versus your blog which you have your own platform and that sort of thing. So can you just kind of talk about you know putting all your eggs in the Amazon basket versus your own stuff? Scott: Yes let me do the big caveat at the beginning, this is a very dangerous strategy and I’m fully aware of the danger of it, and for anyone out there who is messing around with Google and have built niche sites around the Google algorithm you know how painful it can be when you build your site around one platform. So that said with both my kind of what I call the Steve Scott kindle books which are about internet business and internet marketing, and the habit books which are kind of the website behind this developgoodhabits.com. I would say both of them are– my primarily strategy is to build an email list behind them. So if anything ever happens to Amazon at least I have the email list and I can do a quick pivot and perhaps publish on other platforms. But yeah I would say definitely it’s relying on one platform for your income is definitely scary. And like I said it’s something I do but you should really think carefully about before going ahead and doing it. I guess if you have any more questions about that? Steve: Yeah actually since we are talking about it, so how do you get the email addresses from the people that you sell books to on Amazon? Scott: Sure the first thing I do is I actually have an email offer inside the first 10% of every book. And when people either whether they are browsing for the book or when they go download it or buy it, the first thing they will generally see is a free email offer. So it’s which I’m sure you’ve talked about on plenty of other podcast but it’s your typical free piece of content that if you sign in for your email list they get it and then they are now a subscriber. Scott: What I like about the Amazon platform is that these are all potentially– I’ll say the large percentage are actual buyers instead of just tire kickers or freebie seekers. And I’ll say beyond that I also try to expand on my email list by– right now let’s say I have a better blog, blog posts are two per week. And I do slide share and I do a couple of other things that kind of bolster my email list through other traffic strategies. But I’d say right now the main driver of my email subscribers is the kindle platform. So it kind of built on one another like a snowball effect. Steve: Okay so you basically have a URL in your book? Steve: And they have to type it in and then they enter in something and you give them something free that kind of adds to the content of the book, is that..? Scott: You literally don’t even have to leave your kindle app to even sign up for my email list. Steve: I see okay. That’s pretty cool and then after do you try to sell them on other books on the kindle platform or do you sell them on your own site as well? Scott: I try to sell them a little bit. I have a real small kind of a warming Auto responder sequence, so it’s about three, or four emails, I forget the email. And it’s just it introduces me there as one that actually really describe a really deeply personal story, it’s called How Habits Saved My Life and that’s actually about kind of what I went through when I first got into online business, and how I kind of became a better person because I developed good habits. And then it was just– it’s a couple of other smaller kind of emails. So the idea here is just kind of introduce them to me as a person, as an author. Scott: And I definitely recommend my kindle books inside the email list by like the first, I would say the first 10 days or so. I try to keep as pitch free as possible. Steve: Okay-okay all right. So let’s talk a little bit more about just publishing books. So first of all I’m going to kind of ask you some questions about what it takes to become successful author. But can you first give the audience an idea of how you are doing today in terms of books sold, and how many books do you actually have out? Scott: I have 46 books right now. Scott: And that’s further across three I would almost say 3.5 platforms, maybe I’ll explain this. There’s the internet books, I tried for a while because I’m lazy like everyone else. I tried outsourcing a whole line of children’s animal books. And they still make a couple of hundred dollars a month that really I just I learn a lot of hard lessons about what it takes to outsource content and really it was pretty brutal for me. Steve: So let’s see, you have children’s books, you have internet money, and making money I guess online type of books? Steve: And then Habits books which are more personal development type of books? Steve: Okay and then so what’s like the breakdown? How many of each do you kind of sell on a given month as an example? Scott: I would say maybe 0.5% would be the children’s books and I would say another 15 to 20% would be the Steve Scott books, and then the bulk of it are the habit books. And those are the ones that have really taken off pretty much what I’ve been focusing on for the last year or so. Steve: Okay and so just curious, do these books ever have to get re-written as things go out of date? Scott: I would say definitely the internet business books I almost feel like some of them either I want to take down because the content is outdated or just completely revamp them. The habit books not so much, but there is one book that really took off, did really well but I made a lot of very critical flaws in them just the way I wrote them, the way I presented the content and stuff I did include. So I would definitely want to rewrite that book and actually that’s what I’m planning on doing for December just do a complete revamp of the habit staging book. Steve: Okay and then in terms of the breakdown of what you make on your own site versus kindle, what is kind of the breakdown? Are you almost all in kindle right now? Scott: I would say yeah I’m 100% in for the Amazon platform with a bit of a sub breakdown where I generate some income from Create Space which is like 1000 or $2000 a month. And some income from ECX which is the audible platform for Amazon and that works out to be about 3 or $5000 a month. Steve: Okay and so you are pretty much easily doing six figures doing all of your books stuff on Amazon, right? Scott: Yeah definitely, like my highest month has been $60,000. Scott: But I hesitate saying that because now it’s like people are saying, oh Steve is currently making $60,000 a month. No it’s just the one month. I would say recently it’s been anywhere from the 40 to $20,000 like most recent month it was down to $20,000. So it definitely fluctuates. Steve: Wow okay that’s a lot of books and these books are all like in the range of like 2.99 each, right? Scott: So it’s very high value in business. Steve: Okay, okay. Cool so let’s say I have a book I want to write. Can you just kind of walk me through the process and the overall high level strategy for making a living doing this? Scott: I would say take a step back and not think of a book you want to write. I will almost say you start with a niche. And I really think I did listen to the interview with Johnny Andrews that you did, but I’ve heard him on other podcasts and I would definitely agree with what he says for the fact that you really want to like narrow down into one particular topic other if you are a fiction writer narrow down into a specific genre. Or if you are a nonfiction writer narrow down into a specific topic. And I would start by really researching that topic and just making sure it’s something that sells well on Amazon. And when I first started the habits market I went through a whole like bunch of stuff for– I checked to see if there is just people blogging about it. And off the top of my head obviously habits you think of zenhabits.net. Scott: And there is [inaudible 00:12:50] I know he writes about habits. You also want to go to Amazon to see if people talk about habits, see what type of books are selling on Amazon. And at the time there really wasn’t too much written about habits. Sadly I think I’ve had to kind of create my own competition because all sorts of habits books now. But at the time there was– actually which is still really doing well. There is The Power of Habit by Charles Duhigg which has been selling– it’s just a monster seller for the last couple of years and I absolutely love that book. And I could see the potential that people really kind of want to learn about like habit development. I poked around Amazon, I looked at it and the litmus test I like to use is when you are looking at particular type of books you just click on the book description, go down to the product description and you’ll see a number says Amazon best seller ranking. And if you see consistently on a number of books if you see books that are selling under the number 30,000, that generally means they sell at least five or so copies a day. If I see a couple of books like that that have a pretty high sales ranking like that, then that means that there is definitely people interested in that particular topic. But I did that your basic keyword research, I went to Google the AdWords.google.com, kind of looked at the different key words to see if there is demand for it. And I’m sure you’ve talked about this with blogging, but I tried to see if I could come up with 50 topics just off the top of my head what can I write about. At that point when you know you have a lot of stuff to write about, you know there is demand and then I would say it’s time to actually narrow down on your actual book topics. Steve: Okay so that kind of implies that you are writing a lot of little books as opposed to a gigantic monolithic book on a subject? Scott: Yeah definitely. I would say a good example when I kind of– I guess I discovered this strategy with the third book. I want to talk like kindle publishing but obviously I didn’t really know too much about it so instead of just writing one massive book about kindle publishing I wrote How to Discover Best Selling Book Ideas. And it covered what I just talked about, how to actually vet a certain idea, make sure if it will actually do well on Amazon platform. So instead of just writing about everything kindle, I just wrote about one particular topic. And instead of pricing a book at 4.99, 5.99, 6.99, I just took one topic, wrote about 15 to 20,000 words, and really drove down at that one particular topic. And honestly that’s been my business model ever since then. Just finding one topic and really focusing on a good solution. Steve: Okay, but that kind of implies that you need to write a lot of books. Scott: Definitely and I will be very honest and say it’s not the most passive strategy in the world. You definitely have to have a lot of button shared time and really sit down and dedicate yourself to writing at least five to ten hours a week I would say at the bare minimum. Steve: Okay so this ranking is Amazon sort of ranking of 30,000. So you are kind of shooting for around five book sales per day for a given book is that…? Scott: That was at the very least for me like I want to know at least if the idea takes off or at least sell five copies a day. And I’ve with a lot almost all my books I’ve sold way more than that, but there have been a few that just kind of bombed and never really went anywhere and I feel the times that those ones bombed is when I didn’t pay attention to that role. Steve: Okay and so the ones that bombed, you didn’t look at any sort of seller rank? Scott: Yeah I just kind of– I kind of went with what I thought people would want and that’s like instead of actually what I’m starting to do now is I’m actually starting to have dialogs in my email list asking them questions about what type of content they want, almost like you would with the products. You start asking questions like what type– for instance what type of habit would you like to learn. And recently with the book I’m currently developing I’ve found that people really having trouble with exercise. And I guess more about the motivation behind what type of exercise or getting motivation to exercise, and then answer a bunch of follow ups questions for that and really try to drill down on particular problems that they are facing. Steve: Do you actually do pre sales with your email list as well? Scott: Because I guess it’s just a matter of the publishing schedule I try to maintain is pretty fast, it’s about– now it’s about every six to eight weeks. So trying to promote new books, old books, recommend blog posts, I just I find there is a lot going on. So once a while I casually mention what I’m working on. But I almost use like the questions as you know way as pre-sale deal before I actually release the book. Steve: Okay and then if you were to just kind of look back and compare the books that bomb versus the ones that were successful, what are some other things that you did that made a book bomb or be successful? Scott: You will get those feedbacks and that feedback will be later on. But as far as like having a process– usually the process I’m actually constantly trying to improve on my launch process and trying to get a little bit better each time. Steve: Okay and so the first step in your process is to find a niche or a pretty broad reaching topic that you feel like you can expand upon with multiple books. Is that kind of accurate? Scott: Yeah absolutely, and just for me I just I always kind of be in the habits anyway, so it felt like kind of a natural segway for what I want to write about. And it does give me some flexibility for what I can talk about. Steve: Okay and then let’s say you’ve started writing and you’ve gotten some feedback from people and then you are done, what are some of the next steps? Scott: It’s actually kind of a lengthy one but I like to do a brain damp just take out a couple of pieces of paper, write down everything you know about a particular topic. If you are not really sure about a certain aspect, that’s something you might need to research, at least write down I need to research this particular section of the book. And literally it’s like a complete brain storm, and I would say spend a couple of hours doing this. And what I would like to do next is take a stack of index cards and just flash out the actual book itself. So I’ll take the eight or ten points of the book that I find are really the strongest points that can be broken down into subsections. So I take those and those will act as my chapters. And I literally go from crossing off ideas from the brain damp on that sheet of paper and putting it on to index cards. And the reason I pick index cards and I guess as an aside people of kindle also do the same thing with the scrivener software, I just– I’ve never really been a huge personal fan of scrivener but other people absolutely love it. But you can do the same thing or sort an idea just you doing on your computer instead of the in person or like with actual physical index cards. So with index cards then I just separate them. I kind of reorganize them, I rip up sections I just don’t think it will really work, and I cross off sections. I try as much as possible to make a really tied book with the index cards. From there I’ll just do kind of a string of a consciousness writing rough drafts. I’ll just literally write down everything I know, almost using index cards just when you see one line I’ll just write as much as I know about that topic. And the first draft is really, it’s ugly as sin, it’s terrible looking, but it’s important to kind of get that out of the way. So your idea here is you are kind of overcoming writers block and just not staring at the cursor of death wondering what to write next. So you just– you blast through that rough draft and then the second third and forth draft you really try to clean up and polish it. And I’m at the point now where actually by the time I hit the forth draft I pass off the one editor. She comes back, I get the corrections, and I pass off to a second editor. I’m sort of relying more on teams to actually kind of refine the book and make sure it’s tight and as good as possible. Steve: So you actually have two editors for your books? Scott: I would say the one almost acts as the developmental editor where she really will come back and make some suggestions, talk about stuff that should be deleted or stuff that should be added, that sort of thing, fact check, or link check, that sort of thing. Scott: And then there is a second editor he kind does more like a proof reading kind of final run through with that just to make sure everything is good to go. Steve: So you absolute recommend having someone else tale a look at it before you publish? Scott: When I first got started actually a friend of mine he looked it over. But I would say you almost want to pay someone to do it professionally, someone that actually has experience for instance. You can hire someone from anywhere form point five cents, so half a cent to two cents a word. That’s generally the going rate at least for that hire people for. Steve: Okay and then interesting. For your first books did you try to do it all yourself in the beginning? Scott: That’s why I’m so bullish about editors now. I made the rookie mistake of assuming since I knew the content that people would just see the content and not see the typos and the grammar mistakes. And it wasn’t until like the seventh or eighth book that I realized like wow this is– I’m getting frequent comments about typos. And maybe even though I proof read it, I looked over a bunch of times it’s just– there is something about when you look over your own stuff, your mind thinks it sees what’s supposed to be there and not what’s actually there. And I for instance I miss words sometimes. I sometimes say words double. It’s just stupid mistakes, but when you are too into it you just don’t see the critical errors that you are making. Steve: Okay and then they also take care of all the formatting and everything also, right? Scott: Truth be told I’m still trying to find the right way to format my books. So just I’d say that’s one of my major flaws of my business right now is not having the best formatting. Steve: Okay but it sounds like from a priority perspective you are doing pretty well without one. So it’s definitely not necessary. Scott: Yeah but I don’t know I like the idea of continuous improvement. So I’m always trying to get a little better at self with every feature book. Steve: So one thing that Johnny mentioned in the last interview was the book cover was one of the most important factors. So how do you deal with the book cover in your case? Steve: Yeah I completely 100% agree with him. Steve: I was very fortunate that early on I found a really good book cover designer, and again I look at book cover design as an investment not an expenditure. And I really feel that’s an important distinction because people– I feel a little off that really they don’t really want to spend money on their book cover and I feel it literally has a direct correlation between sales and what people are looking at. And the mistake I see is they’ll go to Fiverr and they’ll just hire someone for five bucks who’ll create a really simple looking cover. And I just I think they’re shooting themselves in the foot, but I have a professional cover designer. He sends back a couple of photos that he found from I stock photo. We talk about the concept of the book and he kind of tells me what base image to buy, I go buy and he handles the rest. But it’s– I guess it’s just a matter of really trusting the guy or girl that you work with and having an ongoing conversation about what you actually need for your book cover design, but that’s something that unless you’re a really good graphic designer you shouldn’t be doing it yourself, and you should be willing to spend a little bit of money on it. Steve: Okay how did you find your guy? Scott: I just– I do what I call a human split test, well I do this a lot of new projects is I’ll hire two people to do kind of the same project and I’ll just find the one who responds the quickest, who seems more interested in the project and not just trying to cross off the list but actually is engaged, and kind of the overall quality of their work and just by putting two people together you really have a good idea of who is the best candidate. Steve: Okay and then what about in terms of naming your book, that’s probably really important as well right? Scott: Absolutely and I feel that is the success of the habit stacking books since I came up with a pretty clever name. One of those names just kind of came to me but what I’ve done in the past and actually what I still kind of do is I’ve gone to sites like Copy Blogger or other places that have really good titles and I’ve literally copied and pasted all their titles into a swipe file. And I have just a binder full of swipe files of all these different websites, if I find a good title of something, I’ll throw that in there as well. And every time I come with a title I’ll pull it out, I’ll look at different words and I’ll literally run through 20, 30 titles tweaking and cutting and asking people’s opinions here and there, but it takes me a couple of hours to come up with a good title. Steve: So in terms of the strategy for your title, is it kind of along the same lines of coming up with a headline for a blog post that you want it to be very clickable? Scott: But yeah you definitely want to– you want to class something fairly clever. I tend to gravitate towards two or three word main title, like a book I just released a daily entrepreneur or something like that or habit stacking, something that creates a little bit of curiosity, and the sub headline actually gives a little more of an explanation about what the book is about. Steve: Hold on one sec Steve you’re breaking up. Steve: You still there Steve? Steve: Okay I think you’re going to have to start that section over, I lost it all. Scott: Where did you lastly lose me? Steve: You were– let’s see what we were just talking about, what were we just talking about? Scott: The headlines and sub headlines I was kind of giving a for instance. Steve: Yeah so I think I lost you when I asked you that question about so the sub headline is more about getting the person into entice a person to buy and then you started talking about, so that’s when you started breaking up. Scott: Okay so just let me know when you want to start again. Scott: The idea there is with the sub headline you really want to kind of drill down and almost zero in on your target audience and who’d be most interested in your book. Steve: Okay and then all those words fit on the cover? Scott: It’s my cover artist is pretty good, it’s definitely small fonts, but I would say you don’t have to get as wordy as I was on that particular title, like I tend to– my subtitle is a little bit short, I just for me that was personal teaching because a lot of people like say for instance if you’re a tax consultant and that you work for yourself you’re technically a freelancer or you’re an entrepreneur but you might not consider yourself an entrepreneur. And so I was trying to like hit all those touch points at different people who might be interested in the book. Steve: Okay. No it makes sense; it’s actually a pretty enticing title. So let’s talk about the most important part, how did people find you? Like what’s your promotion strategy? Scott: Honestly my biggest promotion strategy is the email list that we talk about, that we just talked about before. Scott: So I really try to get as many people on my email list as possible and actually I would consider that more important than the blog and the kindle books and all that. I really just– I try to build that email list as big as possible and have them as engaged as possible. Scott: So when I launch a book I actually do a kind of a slow roll out lately. So I’ll email my Steve Scott list people interested in internet business stuff and they– even though a lot times my books don’t really directly relate to internet business people still pick it up because they might find it interesting or it just talks about productivity, that sort of thing. So I’ll email them on a Monday, then I’ll email my “Develop Good Habits” list on a Tuesday. Wednesday I’ll do social media, so I’ll do like the Facebook, Twitter, couple of Facebook groups that I’m in, and actually that’s what I was currently doing today. And Thursday I’ll do kind of last chance the book is going up to its normal price at 2.99, I’ll do that on Thursday and same thing on Friday. So I try to consistently promote it throughout the week and I do a lot of other little things like I’ll change the advertisement and creatives on my blog, a couple other places that people tend to click on my website that sort of thing. So I try to do it really slow and consistent that Amazon algorithm will start to see that this new book is getting consistent level of sales and they’re more inclined to give it a little more visibility on their platform. I find that when I do that, when I price a book for 99 cents through a solid week of promoting it, about the week mark maybe after 10 days or so Amazon starts to really pick up the slack, starts to promote on their end through email campaigns and posing on the hot the top 100 list, the hot new releases list, and a couple other sections on Amazon. Eventually they’ll see that this is a book that people want and they’ll start promoting it through their end, and it’s almost like a reverse 80-20 rule. So at first I do 80% of the effort, Amazon does 20%, and after about 20, about 10 days or so it reverses where Amazon does 80% of the marketing for me. Steve: Okay so let me just summarize what you just said. So your basic strategy is to give it that initial push until it reaches a point where Amazon recognizes that it’s a best seller or it’s going to sell well, then they take over from there. Scott: I really try to emphasize pushing everything on Amazon, that’s actually really why I’ve put all my eggs in one basket because I feel that yes there are other book platforms but all the stuff that Amazon gives you is worth the exclusivity that you have to give and be part of the KDP select program. Steve: So what is the– how many books do you have to sell to get Amazon to recognize you and start taking over? Steve: I’ll link that up don’t worry. Scott: Yeah I’ll give the link, my friend Nick Lopper actually had a really good successful free book launch and he actually wrote a whole blog post that details the whole strategy that he followed. So there are ways and actually, I guess this is great for people that really don’t have a large e-mail list that you almost want to launch a book for free instead of launching it for– at 99 cents. Steve: Okay can we just talk about KDP versus KDP select for a little bit. Scott: Sure, when you join Amazon anyone can join Amazon, put the book up there and if you just put in the normal KDP, you can also sell the book on Barnes & Noble, Kobo, Apple, all the other book platforms or you could even sell on your own blog, you could sell pretty much anywhere. If you join KDP select you have to sign a 90 day exclusivity contract where no more than 10% of your content can be sold or distributed anywhere else. So for all intents and purposes the book has to be unique to just Amazon and nowhere else. A lot people complain about that but I think Jim Crow from Author Marketing Club, he says the best that it’s really only 90 days when compared to traditionally published book that can take away four, five years of the contract and it’s really not that big of a deal. And if you put a book in there for 90 days and it doesn’t work for you then you can roll it out to other platforms. And I just like it because you get either the five free days like I talked about or you can also do what’s called a countdown deal where you drop your book down to 99 cents, and there’s for a week and there’s like a little ticking clock that kind of gives a little bit of scarcity to the book and people are more inclined to buy when they think it’s only temporarily at a low price. Scott: It’s pretty substantial. You don’t make as much on a per unit sale, but you get a decent amount of income and also it helps with your ranking. So say if 50% of your sales are kindle unlimited they still count that as sales, they don’t count that as something separate, and so it helps with your ranking algorithm. Steve: You know I’ve heard of some people giving away their books for free and not being on KDP select. So have you seen that happen, and if so what’s kind of the advantage of KDP select at that point? Scott: Oh yeah, that’s the perma-free technique, and that’s kind of a backdoor technique you can do with Amazon where you post a book on Amazon, you drop it to 99 cents and then you publish it elsewhere on other platforms through smashwords.com, and you price it down to zero like basically give it away for free there. And then when you see that the– once you see the smash words distributes to other platforms you find those websites, you find the link and you go back to Amazon and tell them you have it for free at these websites and a lot of times you need your buddies to do it. That’s why you need a couple of people telling Amazon that they found this book for free on other websites, and then ultimately or eventually Amazon will price match it and drop it down the zero cents or just completely free. And the idea there is when you have a free book it kind of acts as an entry point to your funnel. So I know a lot of fiction writers, they’ll take the first part of their series and given away for free, and hopefully hook people on their content and then get readers to go on to buy their second third fourth and fifth book. Steve: Okay and then if you get that successfully working, then what are some of the other advantages of KDP select at that point? Scott: I would say if you have a perma-free book– I guess some people don’t really want to give away the book permanently for free. They actually generally want to sell it. Scott: So it acts almost like the free almost acts as the sales tool, as a way to attract attention to not only that book, but potentially other books on a catalog. So the idea is they give their book away for free for a couple days to get some extra visibility, and then when the book goes back up to its pay price people will be picking it up. There’s a higher success chance of all people buying as one price. Steve: Okay but just because it’s zero dollars you can still raise it at anytime right? Scott: Yeah you could and with the KDP select with those five free days you can raise it at any point during the promotion, you could just immediately stop it in the middle of promotion if you don’t like the numbers or you just you aren’t getting any value from it. Scott: With the countdown deals where you’re pricing a book temporarily for 99 cents, you’re locked into that discount for whatever time that you select. Steve: Okay and then in terms of getting visibility in search and getting reviews, do you have a strategy on that? Scott: Yeah that’s, it’s– I’ll be honest it’s hard to do when you’re releasing books on a regular basis. If you have one or two books out there, it’s easy to build a bunch of people who are willing to go and leave reviews, but when you have continuous books it’s definitely a challenge. What I like to do is every time someone e-mails me or that asks or talks about something I wrote in the book or compliments me on a book or generally seems like their interested in the book, I’ll reply back. I’ll talk to them and hopefully solve whatever problem that they’re facing and then I’ll ask for a review. I’ll give him a direct link to my book and say can you go– if you have a chance can you just leave a couple sentences review, it really helps. And if they actually go back and do that, then I just say I’m building a street team, I’m building a group of people who will receive a free book in the future, do you want to be part of it? And if they decide to join then every time I have a new book I just e-mail the select group of people and same thing I just– my new book is out, would you mind leaving a review if you find it useful. And I really– it’s a really light touch point where you don’t say go leave me a five star review, just say leave a review. Scott: There are a couple of other things I’m currently testing as well. Steve: So in terms of reviews are they huge in terms of getting visibility for the book? Scott: They’re not the end of the world like some people make it out to be like if you don’t get 50 reviews your books are going to tank, like I’ve successfully sold books with less than a dozen reviews on them. And I would say another thing like you’re going to get negative reviews and it’s important to pay attention to the content review of just– if it’s something that really adds no value don’t worry about it, but if you keep on seeing stuff pop-up in reviews itself or multiple reviews, then pay close attention to it and try to fix whatever error they’re pointing out. Because no matter how hard you try, you’re going to make mistakes in the book and it’s just a matter of trying to improve on it, and just engaging even negative review people and just finding out how you can better help them. Steve: So you respond to negative reviews? Scott: I’ve had a couple– I’ve only done this two or three times where I got into a debate with somebody and that’s just someone who was really negative and hostile. And the one time in particular that I’m thinking of is just someone who literally attacked my character and accused me of all sorts of awful things, but I felt at that point I– anyway it was like three pages long, it was like the longest review I’ve ever read. Scott: So I felt I had to defend my stuff because it was– no matter what I try to prove the guy still just doesn’t believe me, so I just you know you can– you’re going to get some hate if you do well on– if anything people are just going to hate you for no reason. Scott: So I try not to let it affect my day, but when I feel I have to I will reply back, but most of the times I just try to ignore them. Steve: Okay I can’t imagine that’s a good use of your time to respond to a three page rant. Scott: No, not at all, it’s like the reminisce of a crazy person. Steve: So a couple other questions. It is kind of more kind of more random, so you mentioned that each of your books you try to keep it 20,000 words, is that accurate? Scott: I would say at first I definitely dipped under the 15,000 words and in the last year or so I tried hit 20,000, actually my most recent book I hit 35,000. So again it kind of goes back to continuous improvement. I feel that Amazon is getting more competitive, so I’m trying to increase the content, just really try to add a lot more value in every book, but keep it at the same 2.99 price point. Steve: Right so you mentioned 2.99 price point, is there something magical about that price point? Scott: I like the 2.99 price point because I consider each book an entry point into my overall brand, so if someone is interested in cleaning up their inbox or something like that, they can check out that book and they go on and like that, they know that there’s a bunch of other books that they can check out as well. So I like to get them in as the lowest price point as possible and hopefully hook them into reading more books. Steve: Would you say the majority of customers buy more than one book? Scott: I would say the people who don’t like me; they definitely don’t buy more than one book. Steve: Oh yeah obviously yeah. Scott: But I would say yeah my customers absolutely I get a ton of emails saying oh this is like the 9th book I’ve read by you, so it’s something you definitely you love hearing, at least I love hearing that. Steve: So it sounds like you’re not banking on any single book. You’re just trying to get someone in your list where you can introduce them to your entire library of products essentially. Scott: And I also kind of with the countdown deals I definitely run a lot of deals for 99 cents on a lot of my books because even if it’s discounted and I don’t make a lot of money on that particular book, I know that they might be more inclined to check out my other books. For me it’s a long term strategy, I’m just trying to get as many customers and eyeballs as possible. Steve: Okay, and then in terms of the actual book creation process typically how long does it take you to pump out a book? Scott: Double to six, sometimes six to eight weeks now. Again I’m trying to get a little bit better with each book, so it’s taking a little bit longer. Steve: Okay, well three weeks sounds just like a really short amount of time for me actually. Steve: I mean you’re writing like every day for many hours, right? Scott: Yeah, I was definitely a lot unhappier when I did that, because that was I would say that was 20, 30 hours of writing a week, and it was just– the pace was insane and I guess I could do it if I had to now, but it wasn’t very enjoyable. Steve: Okay. And then in terms of do you ever use ghost writers? Scott: I’ve tried, I definitely tried with the animal picture books, and I think I talked about that, that was kind of a failed experiment. Now once– usually in every book there’s one or two sections that are just more research based that just require a list of websites or a list of tools, that sort of thing. So I’ll definitely outsource a small portion of like 1000, 2000 words just go find information on this. I usually just send my VA to do that and but everything else I try to keep it either me writing, or on the most recent book I worked with a collaborator I have, like she wrote a lot of it as well. Steve: Okay and mainly that, so it doesn’t affect your overall brand, right? Your whole library that you’re trying to create. Scott: Yeah definitely and I feel that some people are actually– have managed to successfully build a kindle business off of ghostwriting. I just– I haven’t seen a great example of it and my own life or from my own experience, but I’m sure there’s someone out there who is doing really well, he or she is probably not talking about it. Steve: Okay and then in terms of recommendations on how to get started. Are there any books that helped you get started, or where did you find the resources for yourself? Scott: Oddly enough, the only resources– I didn’t really read a lot of books on it. I just more check out podcasts and just kind of got into the mindset of a writer and some of my favorites are The Creative Pen and The Self Publishing Podcast. Those are– and The Sell More Books Show, those are three podcasts I regularly enjoy and the idea that it’s not really necessarily with the writing process, but kind of the mindset of an author, and what it’s like to legitimately to build a business. It is not the sexiest business in the world, but there is a mindset that if you’re willing to put forth daily effort, you can actually make a good business out of it, but you have to– it’s like a year, it’s a multi-year process, it is not an overnight success. Steve: Sure absolutely as with any business. Are there any online services that you kind of use to help you promote your books that you care to mention? Scott: Which I’m sure you talk about and really for me it’s been Facebook, just connecting with people, talking with other customers, or just joining groups with other authors and connecting with them. And it’s again I guess it’s more of a day-to-day strategy instead of an actual– I guess you have to put a lot of time in actually connecting with people and the payoff is when you have a book people are more inclined to go and buy it, but it’s not like I can go on Facebook and just blast 100 different pages which is go buy my book, you have to build those connections. Steve: Do you ever buy ads or anything like that? Scott: You’re not making much money on– especially if you’re launching a book. I literally make 35 cents on every book purchased during a launch. So there’s almost no way to make the math work. Scott: I know there is Bookpub.com, people absolutely love it, but Book Pub does not like me. I submitted to them like six times already and they just– they keep on rejecting me. I’m going to keep trying, but I would say for everyone listening if you can get a book into Book Pub, it’s definitely worth your investment. I think it’s a couple of hundred dollars, but it it’ll definitely pay for itself, and I have a couple of friends who have done really well with book pub promo. Scott: And there’s a couple other sites I just I haven’t really successfully done anything with them, so I really can’t say if it’s good or not. Steve: Okay sounds good man. Hey Steve we’ve been talking for 48 minutes and I really appreciate your time. If anyone wants to find you, where can they reach you? Scott: I guess two places, there’s stevescottsite.com and I talk about all things like kindle publishing there. But I’m actually starting a podcast in about a month or so and that’s going to be selfpublishingquestions.com. It will probably still be built as we’re talking that’s when the podcast goes live, but I know it’s definitely going to be hopefully launched by the end of November. Steve: Okay, you know I can wait to have this podcast out until then, then I’ll link up your podcast in the show notes. Scott: Sure, that will be great. Steve: Sound good? All right, hey Steve thanks for coming on the show man, really learned a lot today. Scott: Thanks for having me on, it’s great. Steve: I hope you enjoyed that episode. Way back in episode 35 I had another successful kindle author Johnny Andrews on the show, and it’s been really interesting to hear the differences in strategy between the two authors. And the important lesson here is that it doesn’t matter what type of books you write, whether they be nonfiction or fiction, there’s definitely money to be made on the Kindle platform. For more information about this episode, go to mywifequitherjob.com/episode55. And if you enjoyed this episode please go to iTunes and leave me a review. When you write me a review it not only makes me feel proud, but it helps keep this podcast up in the ranks so other people can use this information, find the show more easily, and get awesome business advice from my guests. For more information go to Mywifequiteherjob.com/contest and if you are interested in starting your own online business be sure to sign up for my free six day mini course where I show you how my wife and I managed to make over 100k in profit in our first year of business. Go to www.mywifequiherjob.com for more information and thanks for listening. Thanks Steve and Steve! Really enjoyed and was inspired by this episode. Very cool to hear how you’ve succeeded with ebooks.